Stay up late Tuesday, or get up early Wednesday morning, to catch the moon and Jupiter. From the time they rise until the sun comes up, they’ll be the brightest objects in the sky. 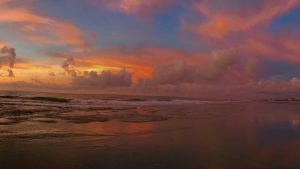 On April 2 and 3, 2018, watch for two very bright objects near each other late at night and before dawn breaks. They are the waning gibbous moon and king planet Jupiter. 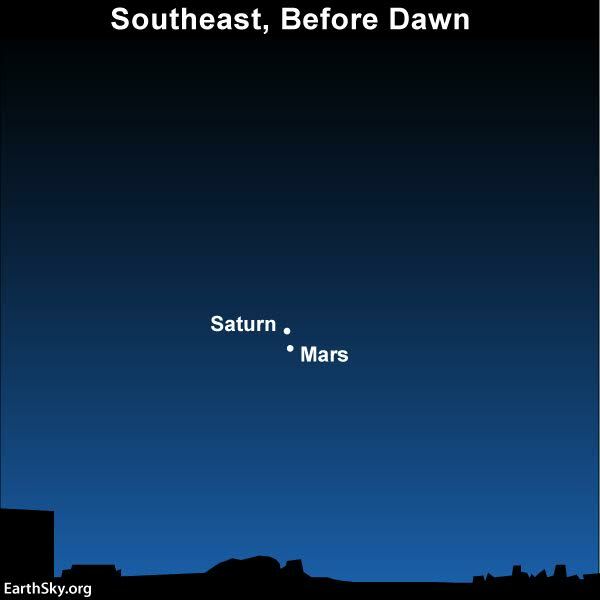 Two other planets – Mars and Saturn – are also nearby. 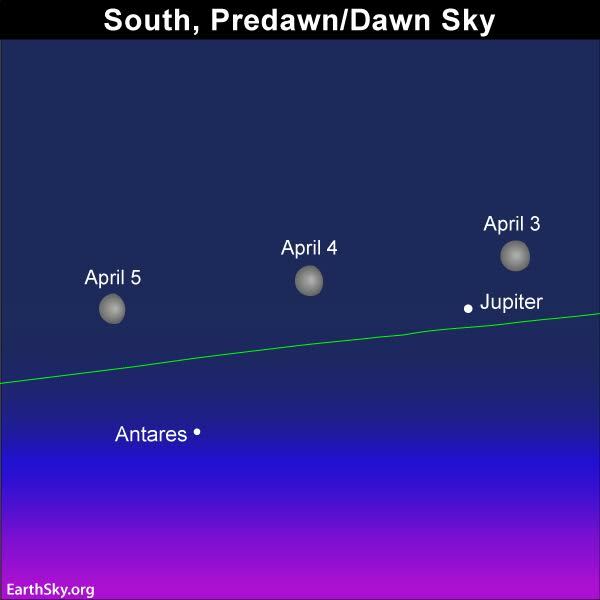 On April 2 and 3, as seen from the northern part of Earth’s globe, the moon and Jupiter can be found ascending in the southeast in late evening. From the southern part of the globe, the moon and Jupiter rise earlier. From the entire globe, after they rise, the moon and Jupiter are up for the remainder of the night. 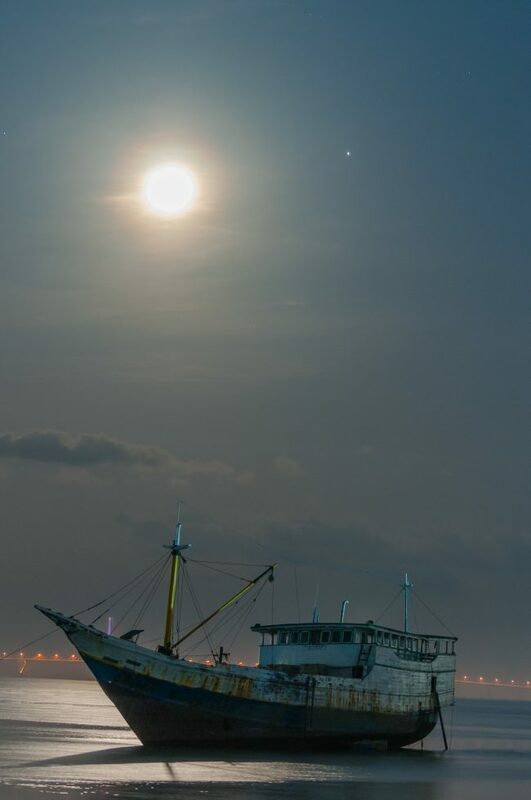 Martin Marthadinata in Surabaya, East Java, Indonesia caught the moon and Jupiter on April 3, 2018. From his location, he said, the moon rose at 7:53 p.m. local time. 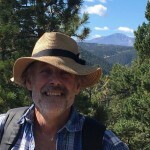 Click here for recommended sky almanacs; they can give you the rising times of the sun, moon and planets in your sky. 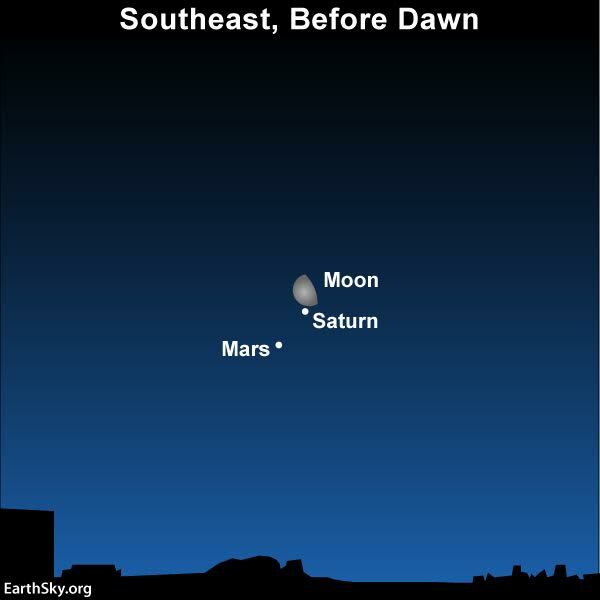 Mars and Saturn are in conjunction on April 2, 2018. They’re in the morning sky, exceedingly noticeable for being bright and close together on our sky’s dome. To distinguish Mars from Saturn, look for red Mars to be a touch brighter than golden-colored Saturn. Read more. Jupiter, the brightest starlike object in the morning sky, easily outshines Mars or Saturn. Even so, Mars and Saturn are still respectably bright, shining as brilliantly as 1st-magnitude stars, that is, the brightest stars in our sky. In early April 2018, brilliant Venus – the sky’s brightest planet – is low in your western sky in evening twilight. 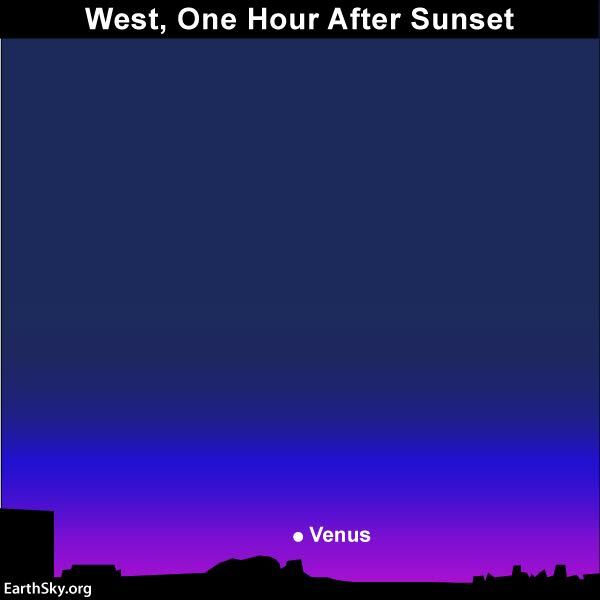 Look soon after sunset, for Venus soon follows the sun beneath the western horizon.